Little thing. I have good news, and bad-ish news. The good news is that I have enough screenplay written up that there's a chance for a possible demo soon. The bad news is that I'm building the game from scratch, since it was built with spaghetti to the max, and it's obviously affecting how the game runs. I'm much more organized and overall better at cleaner design this time, so it shouldn't be an issue at all. This happens when you get better. Sometimes reworking only parts can help. I've done this twice and both times the results have been worth it. Just testing some new stuff. Mostly reusing some older assets to get stuff done. *Added a tad bit of momentum, you now have an acceleration and deceleration time. *Options menu now slides up than just spawning out of nowhere. All overworld UI will be bounded to the bottom, now. *The game is now in 16:9. NPCs now have chatter that can be scripted to say whatever. Lists are now used for NPCs, their animations, and actors. This is so I can create cutscenes with multiple objects easily. It's easy enough to get an actor to walk in a straight line between nodes. 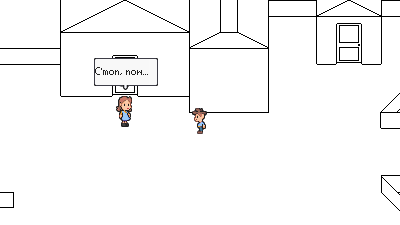 The hardest part would be having NPCs successfully navigate around other actors that may also be moving around. It's doable though. Is there any documentation on how? As I'm at a loss on exactly the way to do it. I am using a system where i place actors as waypoints in a level. The game checks the waypoints and puts the x,y in a list the order i placed them in the level. The enemy actor follows the x,y in the list. Yes/no trees are now no longer a pain to do due to how I rewrote everything. The inventory menu is now somewhat working. Battle portion of the game has been making heavy progress. Thank you for anyone who's been waiting, and sorry for the delays. Interesting. I'll be keeping tabs on this project. I am no longer posting on this thread. If you wish to see updates, please view my Twitter. i love the reflection work! !